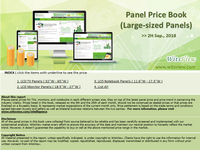 Panel price book provides monthly market price changes of LCD TV panel, LCD monitor panel and notebook panel, classified by sizes, and related specifications. The survey ranges upstream, midstream, and downstream players of the panel industry, in order to stay close to the market reality. Based on professional experiences, the prices are classified into three categories-high, low, and average (Special spec, down-grade, and special deal prices are excluded). In addition to keep clients updated on the latest price trend, WitsView holds the consistent and neutral position toward the market to stay objective on prices. If you would like to subscribe new reports, please fill in the following form for further assistance.